We've got that Friday feeling over here at the Langr house. This weekend, family is coming into town to celebrate birthdays, we're getting dinner with my parents, and there's an alpaca show in town. Let's just say it's going to be wild. But before I try to convince Joseph that we really do need to go to the alpaca show (they're so fluffy!! ), let's take a quick look at the adventures we had over the past week. I haven't had a new tube of mascara since before Joseph and I got married. So this past weekend while we were at Walmart, I picked up some. I was pumped to use it Monday morning, but when I opened the package up, I discovered that it was bright blue. While I have read fantastic articles about how surprisingly subtle blue mascara can be, I promptly returned it and picked up a boring black mascara instead. Maybe one day I'll be a little more exciting with my makeup routine, but Monday was not that day. For now, blue is not the color of all that I wear. Last week, Joseph and I organized all of our tax information for our CPA. Monday we dropped it off at her office and I found out that my excel spreadsheets were incredibly organized. For someone who stumbles blindly through excel with a husband proficient in the program as my guide, I was so excited. If you're in the KC area and are looking for a great CPA to help with this year's tax season, I can't recommend Meghan enough! But I won't feel like I'm free from taxes for too long. As someone who is self-employed, quarterly taxes will be upon us in April. Oh well, that's adulthood for you. Our guest bedroom has been in need of some curtains since we moved in. We don't spend too much time in there, but when we have guests, we quickly remember how we still haven't put curtains on the wall. That all changed Monday night, though. We went to Walmart and picked up a curtain rod and these gorgeous, six piece curtains. The package said that all four curtain panels could fit on one rod. The package lied. For the life of us, we couldn't figure out how they got the curtains to look the way they did on the package without a double curtain rod. No amount of Google searching or YouTube browsing pulled up any results. So either everyone else figured out how to assemble the curtains with no issues, or they used a double curtain rod and didn't say anything. In the end, we just nailed the sheer curtains to the wall. It works. Now at least our guests who stay in the room can have a little privacy. One piece of furniture that I was so excited to get put together when we moved was the coffee bar. It's been a great addition to our living room. But we wanted a few hooks to hang towels and mugs on above the coffee counter. So, Monday (officially home improvement night at the Langrs) we hung up a bar from IKEA. It's a perfect addition! I've realized recently how, even though I've been a Catholic for almost a quarter of a century, I don't know my Bible too well. There's no time like the present! So I printed out a copy of Meg Hunter-Kilmer's Bible in a year plan and tucked it into the front cover of my Bible. I love starting my morning with thirty minutes of His word. I'm only on day ten, but I'm loving digging deeper into the words of Christ. New set of earbuds (that sound actually come through)? Check. Armband so that I'm not tucking my phone into my waistband? Check. Jitters? Check - but I've heard that pre-run jitters can turn into an adrenaline rush, so I've decided to embrace them. Please keep me in your prayers Sunday morning at 9:00 am! I'm running with prayer intentions written on the back of my running bib. If there's a prayer intention you'd like me to carry on my run, let me know in the comments (or e-mail me!) and I'll be sure to pray for you during the 6.2 miles. Wilson doesn't like non-carpeted floors. It's an irrational fear given that his entire cage is made of hard plastic. So, because his cage sits in the living room on a wooden floor, we let him run around in our guest bedroom to stretch out. This past weekend we bought a rug from IKEA ($20 for this beauty, can you believe it?) and Wilson was ecstatic. 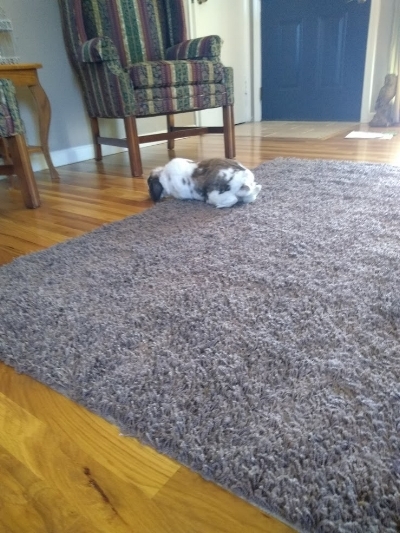 He can jump out from his cage onto his rug of freedom and roam around without having to leave the living room. Maybe one day he'll overcome his fear of hard floors. He has gotten pretty close to the end of the rug and even touched the hardwood floor with his nose. Baby steps, Wilson. Baby steps.